The following letter appeared in the New York Mirror, volume 16, June 30, 1838. The New York Mirror was a weekly journal dedicated to literature and the fine arts. We left Killarney at an early hour in the mail-car for Limerick, a distance of fifty Irish miles. The mail-car was similar to one of the ordinary jaunting-cars, although somewhat larger, and drawn by two horses; being an open, two-wheeled vehicle, with seats on either side, about two feet from the ground. The passengers sit with their backs to each other, the space intervening between the seats is occupied by the luggage. WE passed through several small towns, very similar in character, and containing nothing of interest. The principal were Castle Island, Abbeyfeale, New Castle, Rathkeal, and Adare; near the latter are the estates of Lord Adare, who has rather a picturesque-looking castle. There are several fine ruins in the vicinity, but as were constantly en route, we had not an opportunity of visiting them. 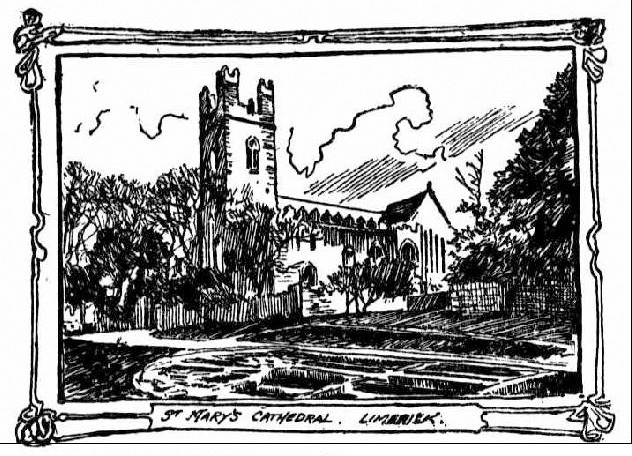 We drove into Limerick at three, p.m., and took lodgings at the principal hotel in the New Town. Limerick is divided into three parts, which are known by the names of English Town, Irish Town, and New Town. The former contains the cathedral, an antiquated pile of gothick architecture, surrounded by the toms of noble families, many of which are of great antiquity. It also contains the ruins of a castle in which King John is said to have resided. Irish Town is principally occupied by the lower orders. The modern part of Limerick (New Town) is inhabited by the wealthier classes; the streets are regular, and the houses, which are mostly of brick, display much neatness ans taste; in many respects it reminds me of Phiadelphia. The Park is a fine promenade, and contains a column erected in honor of Spring Rice. The next morning we took a jaunting-car and rode to Mount Shannon, the seat of the earl of Clare, a few miles from Limerick. The grounds are in fine order, and handsomely laid out, bit the mansion will not compare with many we have before seen. We were shown through its various apartments; the library is a large room, and contains many rare and valuable works, also some busts by Canavo. In one of the apartments is a full-length portrait of the late earl of Clare, Lord Chancellor of Ireland. The present earl seldom visits Mount Shannon. We were informed by one of his dependants, that he had known him to be absent for five years at a time. Most of the Irish nobility reside constantly in England, trusting the management of their estates to stewards, who are often obliged to oppress the poor tenants, to answer the exorbitant demands of their masters. The money thus obtained is squandered in England, or upon the continent. In this manner is Ireland impoverished? On our return from Mount Shannon we again visited the cathedral, and ascended to its battlements, from where we obtained a bird’s eye view of the city and the surrounding country. We also visited the custom-house, and other objects of interest, among which is an old stone bridge, crossing the Shannon, the scene of a desperate battle in the time of King John. We left on the ensuing morning in the mail-coach for Dublin. The country between Limerick and Dublin is in a high state of cultivation, but the scarcity of trees detract much from the beauty of the scenery. Today Mount Shannon House is a ruin, having been destroyed by fire in an arson attack 1920. 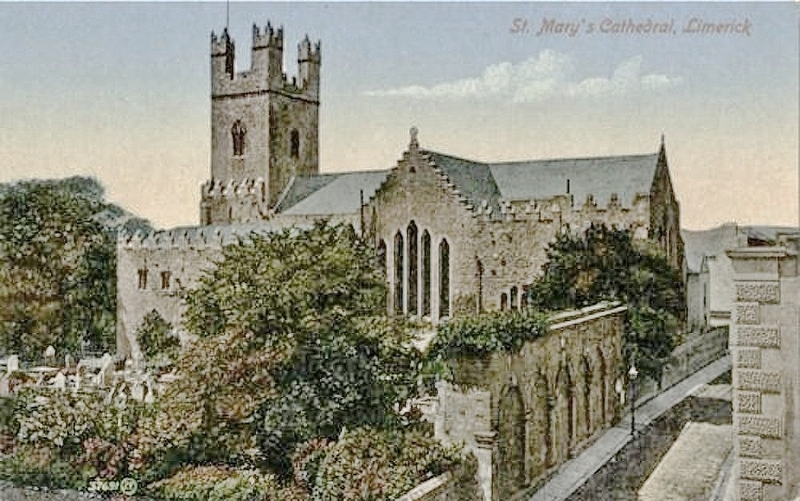 The visitors from New York visited St Mary’s Cathedral twice. The second time taking in the view from the tower. Sharon Slater, thank you for this post. Its very inspiring.